Jon Stewart is one of TV's most outspoken media critics, but at one point during Monday's "Daily Show" the host literally had nothing to say. During the second segment on the "Daily Show," Stewart reacted to Mike Huckabee's controversial comments comparing the Iran Deal to the Holocaust by only contorting his face and gesticulating wildly. That's right, Stewart didn't say anything more than a few indiscernible noises. Instead the host shook his head, smiled, looked angry, and gestured with his hands (including one that used only a certain finger) to clips of the presidential candidate speaking. 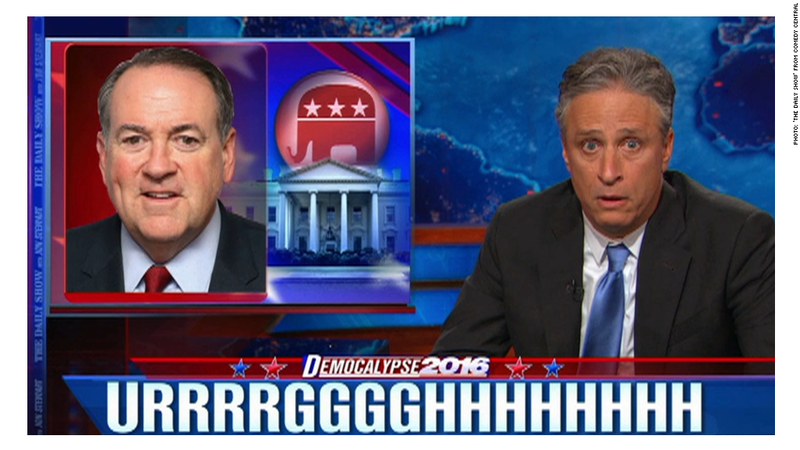 The segment was one of the most surreal in "Daily Show" history. At the end of the show, Stewart explained that the segment was a long-time running joke. "For anybody who was watching at home who thought to themselves, what the hell was going on in that second act there ... for the past I don't know 15, 16 years we've had a running joke, that I could really do the show without saying anything," Stewart explained. "That I could just make stupid faces and grunt." Stewart laughed and continued, "with two weeks to go we thought, yeah why not?! So that's what we did, and I realized that I've been working way too hard." There are only seven more episodes of "The Daily Show" left before Stewart signs off on Aug. 6.